I woke up this morning with a dream of a smokey salad for breakfast. So, I set about figuring out how to make one. First, and obviously, I needed a smoked meat. I wish I had one of my own making, fresh from the smoker! But I don’t. In substitute, I rummaged through my fridge to find a smoked ham, or smoked chicken or something. Et Voila! I have a smoked turkey cold cut in the fridge! Ok, meat taken care of. What else can contribute to a smokey salad? I need the leafy greens. I selected a spring mix, knowing that the extra coloring of the red lettuce leaves will really contribute to the presentation of the dish. I love color, and the more color I can get in to my dish, the better I think it tastes. Next: ingredients. Avocado is almost a must for a smokey salad. I find that a ripe avocado has a very rich flavor, which contributes to any kind of rich dish, the smokey salad included. For mushrooms, I have button and crimini; I’ll go with the crimini, they contribute a subtle nutty flavor, which with the right oil will easily blend in to the smokey theme. 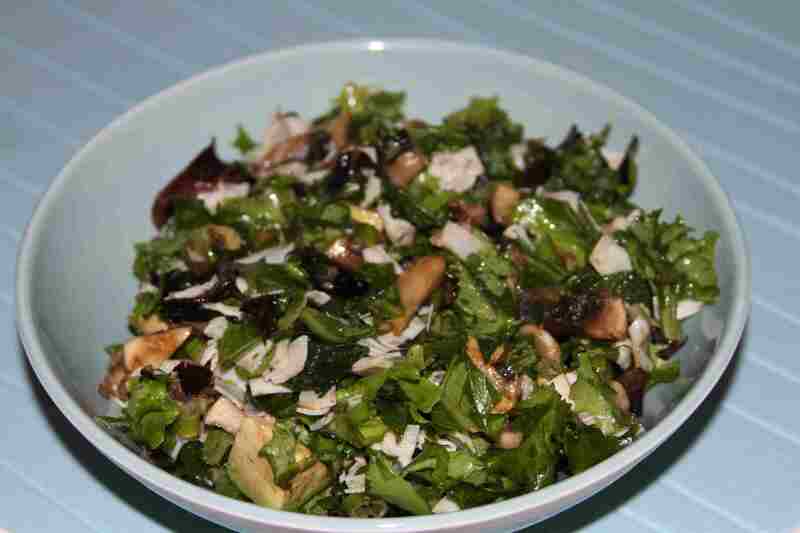 So, Crimini mushrooms, smoked turkey, spring mix lettuce, now I need the oil, and a few more ingredients. Looking at what I have for oil, it was easy to select the right oil for this meal: toasted sesame oil. It’s delicious, and very smokey. I added some mint leaves and green onions to top off the salad. And it came out great! I’m a big fan of the Smokey Salad! Yummy and healthy. Slam dunk on this one chef! Thank you! And more varieties coming most every day!